Here is a simple question to my fellow Americans... Do you give any thought about the purpose of Memorial Day . . . on this day? I suspect it might have slipped by many of you for well-intended reasons. Still, there is really no excuse for any American to give pause for a short time to remember the why for Memorial Day, regardless of where one might be and is doing. Displaying Old Glory is a very good way to show it too . . . even if you are on vacation. our responsibility to make sure that our children and grandchildren know about the “real” importance of Memorial Day. 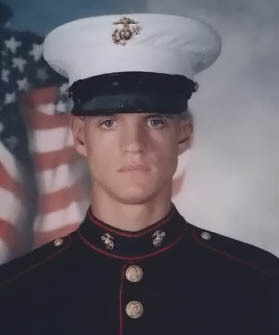 So, when you hear about a fallen like 22 year old Marine Corporal Jason Dunham (pictured here), who has been nominated for the Medal of Honor... it should be a somber reminder about all those he has joined in one of our country's most sacred clubs. Then think about the loved ones left behind, who prayed and worried endlessly for their special one in harm's way. I still think about the period when my youngest son was serving with the Marines in Iraq during 2003 . . . My biggest fear was him becoming a fallen hero. Yes, a father's tremendous pride for him serving would remain, but my anguish over his loss would always be. in sustaining our freedom and way of life. Furthermore, it is never too late to remember and honor our fallen heroes!